It hasn’t been that long since the films made by director LEE Man-hee were looked back upon. There was a major retrospective on his works at the 2005 Pusan International Film Festival and a year after that the Korean Film Archive held a special film program showing LEE’s entire body of work. It may seem belated that such a full scale spotlight on director LEE Man-hee has only just been held some 30 years after his death. Why has it taken such a long time to start? It was because LEE was a creator who stirred up praise and envy from anyone who saw his films, including many directors of the same era. He left this world early at the age of 45, and was forgotten for a long while. More often than not, the laurel of honor is a trophy given to survivors. LEE had been put aside in the still developing field of Korean film studies, which was in a fragmentary condition. 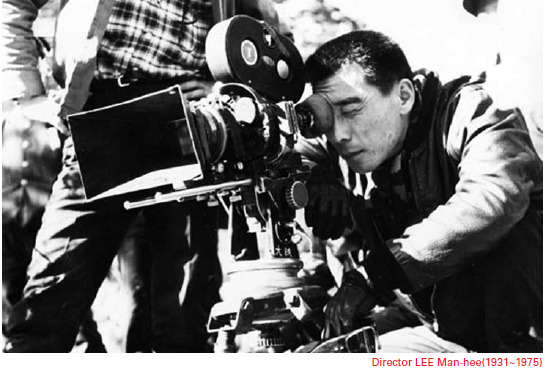 Until recently, the memories of LEE Man-hee were still alive in many filmmakers’ minds and had been transferred by word of mouth, like a legend. Once I met a retired director who used to work as an assistant director for LEE. He confessed to me that the days he had spent with LEE on shoots were amazing. LEE Man-hee had deeply despaired of the fact that he had to make films under the military regime, but he turned that sorrow into great zeal. LEE drank alcohol almost every day, and even then he would talk about the movie he was working on at the time, or of what he wanted to shoot next. Those around him were able to confirm once again what a genius LEE was, out of the fact that LEE had an endless amount of creative inspiration despite the drinking. Even to his fellow directors LEE was a subject of study. For example, the late Kim Ki-young who had never recognized anyone as a better director than himself, had confessed he was much surprised by the works of LEE Manhee. Director Kim Su-yong had also said LEE Man-hee was a director whose level was beyond anyone’s reach. This, on the other hand, may be a courteous remark to a fellow colleague who had died early, but they all agree LEE was a man who could have shown much more to the world if only he had lived longer. 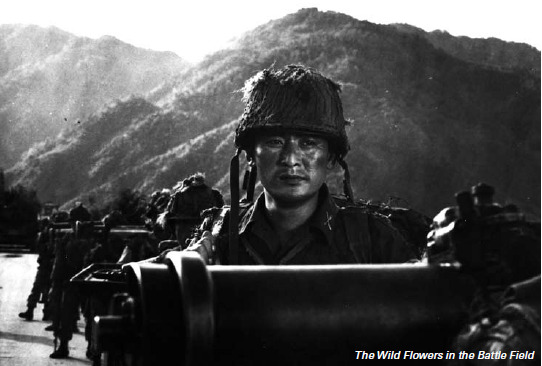 The Wild Flowers in the Battle Field that director Im mentions, was a governmentcommissioned anti-communist war movie produced in 1973 and was directly handled by the Korean Motion Picture Promotion Corporation (KMPPC, predecessor of the Korea Film Council) on a large budget. KMPPC had commissioned directing of The Wild Flowers… and Testimony to LEE Manhee and Im Kwon-taek respectively, who had experiences with directing war films. The scale of these films is unimaginable today, with army units the size of a division mobilized as extras, and an entire village provided as film set. 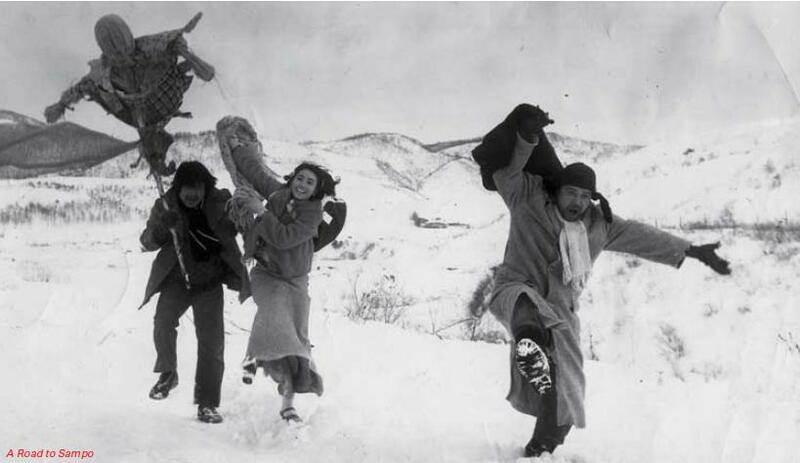 The script of The Wild Flowers… was written by novelist Seonu Hui and was heavily themed as an anticommunist film. However director LEE's interests went beyond anticommunism propaganda. Particularly the opening sequences of the film where the grandeur of North Korean tanks are shown for more than ten minutes is absolutely overwhelming. At the time, the South Korean army was poorly equipped and when the tanks came upon villages and people, nothing could be done to stop them. To fight against such tanks, which could not be halted by any guns or firearms, South Korean soldiers would throw away their lives in a reckless way by jumping into those tanks with grenades in their arms. The scene depicted in the film is not very heroic, but rather delivers a sentiment close to helplessness by showing the painful battle of human beings standing up against these incredible machines. The movie expressed the tragic helplessness of the war and the intelligence agency had ordered the film to be remade in its entirety. All through the movie stereotypical dialogue emphasizing patriotism and anticommunism appear and it is obvious the film had been cut here and there due to censorship. Yet LEE Manhee could work with abundant resources that were almost impossible to have at the time under such circumstances, and he put the focus of this war spectacle not on anticommunism or hostility against the North Koreans but on the humans run over by tanks, displaying a much more abstract fear on war. LEE Man-hee was a director who made plenty of war movies. His early hit Marines Are Gone started the war-film syndrome in Korean movies. As a dead shot himself when he was in the army, it is said he directed the battle scenes by using live bullets. With such legendary episodes, the movie was not only a spectacular war attraction but LEE also miraculously interwove the action of war with humanism by bringing out the humanistic side of the soldiers who try to keep the warmth of the family-like group and keep their love for another despite the tragic status they are in. Later on LEE often made movies on the Korean War, but when he was arrested for The Seven Female POW’s produced in 1965 and charged for violation of the anticommunism law, his personal career was permanently scarred. The movie was accused of being procommunist because it depicted the North Korean soldiers as humane. Thanks to a petition filed by many working in the film industry, LEE Man-hee was released but it is said he suffered from the idea that he could not freely make the films he wanted to make. Nevertheless, LEE continued shooting war films, and besides movies like Living in the Sky and A Hero Without Serial Number, a particular film that should be noted is 4 O’clock, 1950. The timeframe of the film is set at around the outbreak of the Korean War, and it showed LEE’s antagonism against the war, and once again revealed his talent and sensitivity towards new forms. No matter of what genre the films were, LEE was in pursuit of modern forms unlike other directors of the time. Black Hair (1964) that combined the dark sentiments of film noir with a sentimental melodrama structure, The Devil’s Stairway (1964), a suspense thriller that used the mise-enscene of interior space to great effect, action melodrama The Starting Point (1967), Break the Chain (1971), a macaroni western twist made into a ‘Manchurian western’ depicting an army in Manchuria fighting for independence during the Japanese colonial period, were all works with the clear artistic signature of LEE Man-hee. On the Korean film scene of the 1960s, it was not uncommon for a famous director to make more than 4 movies per year, making one quickly with a low budget. Therefore it is quite surprising that most of LEE’s works managed to achieve a high level of quality. Assassin (1969) is a good example. The movie is set at during the time right after the liberation in 1945, a time of turmoil when assassination was common. The camera follows the steps of an assassin who intends to kill a general who was once a leftist but has now turned conservative. Most of the major scenes were supposed to be night scenes, but due to technical deficiencies the film was mostly shot during daytime and absurdly enough such defects are plainly shown on screen. Still the movie is amazing enough to leave the viewer with many thoughts. LEE limited the film's timeframe to one night and by showing the cruelty of the era where killing was done without reason, he did a great job in capturing the desolate air of the time and the internal state of his characters. Assassin was crosscut from beginning to end, and it might feel absurd at first when most of the outdoor scenes that are supposed to be night are in fact shot during the day. However, as the movie continues such thoughts will disappear and we are more and more drawn into the story on screen. Making such magic happen is the power of LEE Man-hee. It is clearly written on screen that the movie had little budget and little time, but not only is Assassin a great movie, it delivers strong impressions. On the other hand, out of all those involved in the movies in Korea during the '60s and '70s, LEE Man-hee was the most sensitive person in regards to the modernizing conditions of life, and he reflected such changes in his film form. In Homebound (1967), when Seoul is seen through the eyes of heroin Moon Jeongsook (who used to be the persona of LEE Man-hee throughout his works), rather than carrying out the story the director sees the image of the space as a whole and even directs it like a flow of thoughts, showing his powerful stylistic sense. Among a similar line of works, one that is often chosen as LEE’s masterpiece is Late Autumn (1966), although unfortunately the print for this film does not exist anymore. Another work comparable to Late Autumn is Holiday, miraculously found in 2005. It was a work that reconfirmed the talents of LEE Manhee once again. Back in the day, Holiday was forbidden to be shown in theaters because it was supposedly too demoralizing. Planned by Jeon Ok-suk, written by Baek Gyeol, and starring Shin Seong-il and Jeon Ji-yeon in the lead roles, the movie captures a day in the life of poor lovers who go on a date on Sunday. Heo Ok played by Shin Seong-il is a jobless young man who faces the world with groundless big-talk although he has nothing in him. When he arrives at the meeting point to see his lover, she is waiting in front of a café. They have no money to drink a cup of coffee. The couple begins their Sunday date like this, so broke that they can’t even meet in the café. The girl announces she is pregnant and Heo meets his friends to find money for the abortion. Until he returns, the girl endlessly waits for him sitting on a bench at the windy hills of Nam-san. Although Holiday begins on this light note, the atmosphere darkens as the story goes on. In the middle of the film, Heo Ok visits a friend in a bar who is telling senseless things to other jobless youngsters: ‘it is not my fault I failed in society even though I finished university’. The camera captures the two talking to each other facing the wall. As they move out of the frame, the camera remains still, gazing at the wall behind. After gazing at the wall covered in meaningless scribbling awhile, the emotion delivered to us through the camera is disdain. Despicable are the lives that cannot be bound together with a certain intention. In the movie, the man wanders and the girl waits. Throughout the movie, during the scenes where Heo wanders, Seoul in late 1960s is exquisitely shown in all its beauty and ugliness. The movie is filled with poetic lines like this toast: ‘to this gloomy Sunday of ours, for the gloomy only, for tomorrow, for yesterday, for the man who stood up his woman, for the woman who stood up her man’ and its atmosphere rushes from extreme decadence to helpless sorrow. At the time, the inspectors suggested that they would permit screenings if LEE changed the story and made the main character go to the army in the end, but LEE refused, thus burying the film in oblivion for a long period of time. Surprisingly enough, even after all these years, the movie still maintains that contemporary quality. During that short period of time when he worked as a director, he had made a large quantity of movies numbering 49 in total. He had made films he wanted to make, but he also made countless movies that the producers wanted him to make. Yet in every one of them he left his own signature. His last work was A Road to Sampo(1975) that sentimentally captured Korea’s countryside in the 1970s. No one knew he would pass away so early. His death was the biggest loss in the history of Korean film, leaving a deep sense of loss to all those in the film industry.